Meeting point Harstad harbour - Expressboat terminal 16:30 / Departure 17:00/ Free of charge, but sign up is necessary. During one single journey lasting three hours, the local speedboat Stjernøy becomes Tidal Pulse, a temporary world emerging from the aftermath of the sociopolitical and environmental crisis, interweaving the abyss and the cosmos into a new history of the future. The engine of the boat, its heart and lung, will guide us with its rhythmical voice through the nightfall and along the waters. Our pulse will be soon synchronized with the tides and the undertows. Other beings will share space with us intermittently, leaving us to reach smaller islands called by the names of uncharted planets. We will see daylight merging into darkness, geographies blurring. Strange critters will emerge from the depth of the oceans. We will slowly drift into another dimension. * Please turn your mobile phones to flight mode to avoid sound interferences. For this new work, Chilean artist and filmmaker Enrique Ramírez recorded the sounds of the boat - the vibrations created by the engine inside and outside the moving vehicle and in the operations room - and composes, in real time, a sound piece that becomes the pulse of this fuel-powered heart drifting along our increasingly threatened oceans. The boat’s pulse intertwines with the voices of local activists, politicians, scientists and workers in the oil industry business, reflecting on issues regarding the future of post fossil-fuel societies, the future of Norway and, by extension, the future of the Earth. 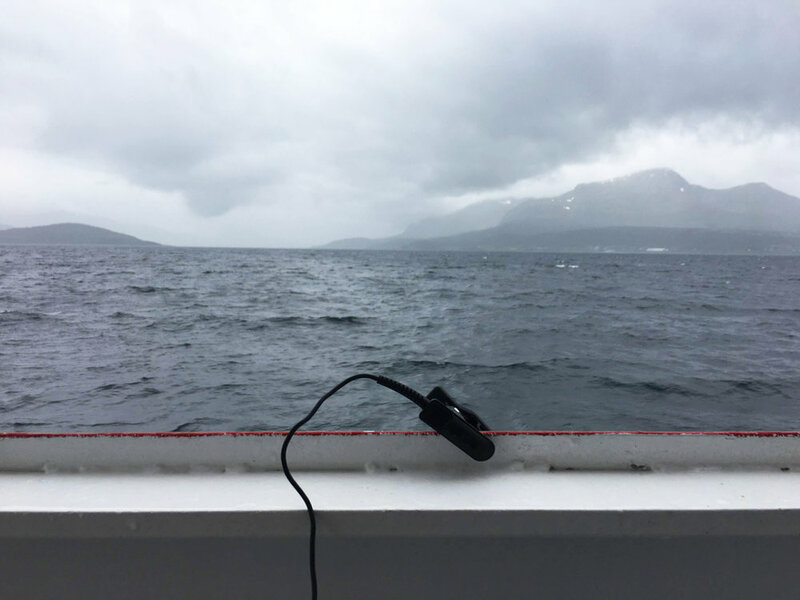 We, the passengers and the audience, can hear these sounds through wireless headphones, having the opportunity to circulate on the boat, to immerse completely in the sounds and images, or even to choose silence. The length of the journey, lasting three hours, invites us to take the time to sense the surroundings and to embrace a slower pace, and it explicitly aims at countering the increasing acceleration of Western societies, which demand us to be faster, more productive and more efficient in the name of a destructive conception of progress. 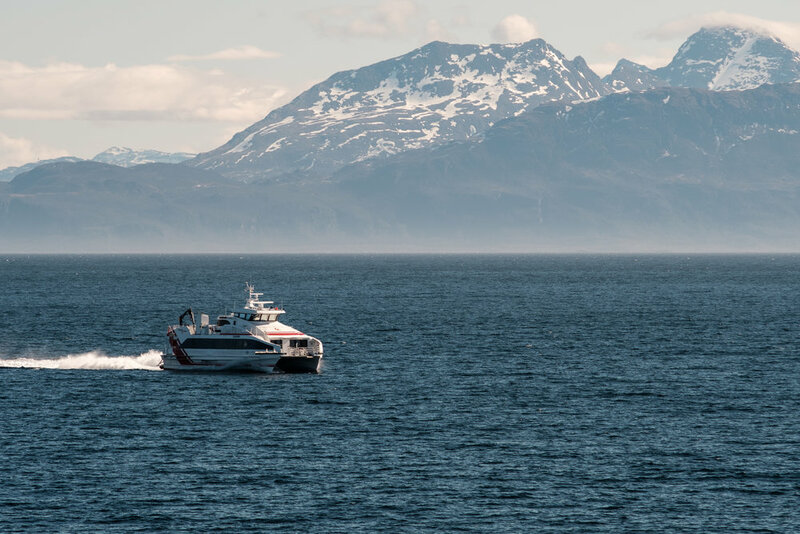 The wonderful landscape of the islands surrounding Harstad will accompany us during the first hour of our journey. But gradually the natural light’s intensity will decrease and the projected light will emerge from the twilight and the increasing darkness. With this modality of presenting moving images in a public space, and especially on a moving object, we aim at reflecting on the different meanings of motion and the temporalities within this medium, as well as exploring other potential configurations of the movie theatre as a privileged immersive space for the reception of video works. The voices and statements that will accompany us along the journey belong to Silje Ask Lundberg (environmental activist, Naturvernforbundet / Friends of the Earth Norway), Barbro Hætta (Sami person and local politician, practicing as a doctor), Kjell Giaever (director of Petro Arctic), Dr. Jack Kohler (glaciologist, Norwegian Polar Institute, Tromsø), Anne Henriette Reinås Nilut (member of the Sami parliament and cultural producer). We thank them for their crucial contribution to the project. We also thank Helene Hokland (director, AMIFF) and Helene Eggen (producer, AMIFF) for the invitation and their deep commitment to the project, the captain and the crew of Stjernøy for their invaluable support, Mat av Vahl for the soup and Therese Jensen for the local seaweed buns served onboard and all the guests for taking the time to accompany us along the journey. Tidal Pulse has been commissioned by AMIFF - Arctic Moving Image and Film Festival, 2018. The images were partly realized during the artist’s research for INcoming (2017), commissioned by Screen City Biennial (Stavanger). 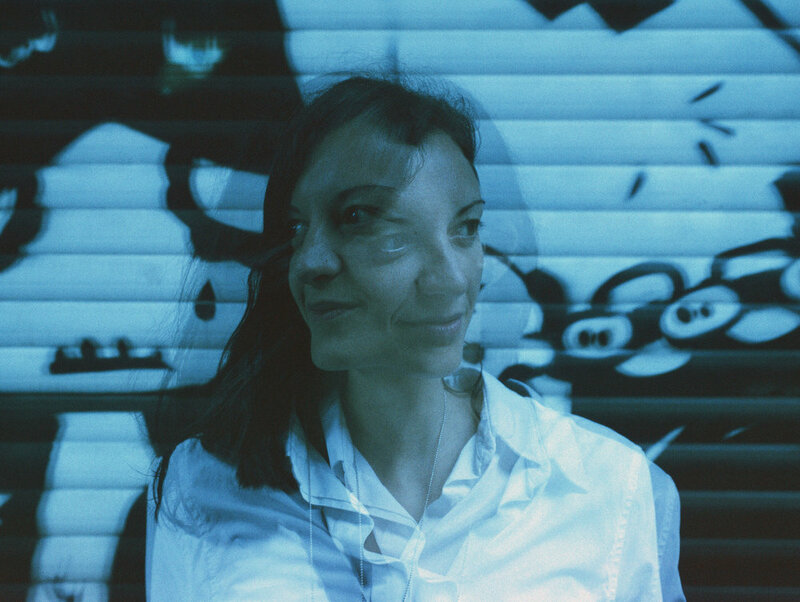 Vanina Saracino (*1984, Italy) is an independent curator and film programmer currently based in Berlin. She is the co-founder of OLHO, an international curatorial project about contemporary art and cinema initiated in 2015 in Rio de Janeiro and São Paulo, also shown at Teatrino di Palazzo Grassi (Venice, 2017) and Palais de Tokyo (Paris, 2018). From 2013 to 2017 she curated monthly selections of artists' films on the experimental channel ikonoTV, being also in charge of collaborations and projects with museums and institutions worldwide. With ikonoTV, in 2015, she initiated Art Speaks Out, a yearly exhibition project on the environment and climate change, also shown at the Istanbul Modern Museum (2015) and within the UN Climate Change Conference (Marrakech, 2016). Other projects include 'Fragmented Vision' (The New Gallery Musrara, Jerusalem, 2018); 'Earthly Mutations: Films From the Near Future' (Salzburger Kunstverein, Salzburg, 2018); 'The Crisis of the Horizon' (Small Projects, Tromsø, 2018); 'Lost Dimension' (AMIFF, Harstad, Norway, 2017); 'The Impossibility of an Island' (within TBA21's 'Open Ocean Space x COP23', Bonn and Laznia Centre for Contemporary Art, Gdansk, 2017); ‘Adrian Paci: A State of Temporary Permanence’, for Lovely Days at Kino Mediteran, Bol, Croatia (2016); ‘Vertical World – approaching gravity’, (General Public, Berlin, 2012); ‘Un Lugar Habitable es un Evento’ (Centro Cultural Facultad de Artes, Medellín, Colombia, 2012). Graduated in Communication Sciences with a thesis in semiotics of the arts, she holds a masters degree in Arts Management (GIOCA, Università di Bologna) and an MA in Philosophy and Art Theory (UAB, Universidad Autónoma de Barcelona). Enrique Ramírez was born in 1979 in Santiago de Chile. Since 2010, he lives and works between Paris (France) and Santiago (Chile). He studied popular music and cinema in Chile before joining the postgraduate master in contemporary art and new media of Le Fresnoy – Studio National des Arts Contemporains (Tourcoing, France). In 2014 he won the discovery price of Les Amis du Palais de Tokyo, Paris, France. He has since exposed in some major places as Le Palais de Tokyo, Centre Pompidou, Espace Culturel Louis Vuitton or le 104), France (le Grand Café, Saint-Nazaire) and in Central and South America (Museo Amparo, Puebla, Mexico ; Museo de la memoria, Santiago ; Centro Cultural MATTA, Embajada de Chile en Argentina, Buenos Aires). In 2017, he is invited to the 57th International Art Exhibition - La Biennale di Venezia curated by Christine Macel. Enrique Ramírez´s work combines video, photography, installations and poetic narratives. Ramírez appreciates stories within stories, fictions straddling countries and epochs, the mirages between dream and reality. 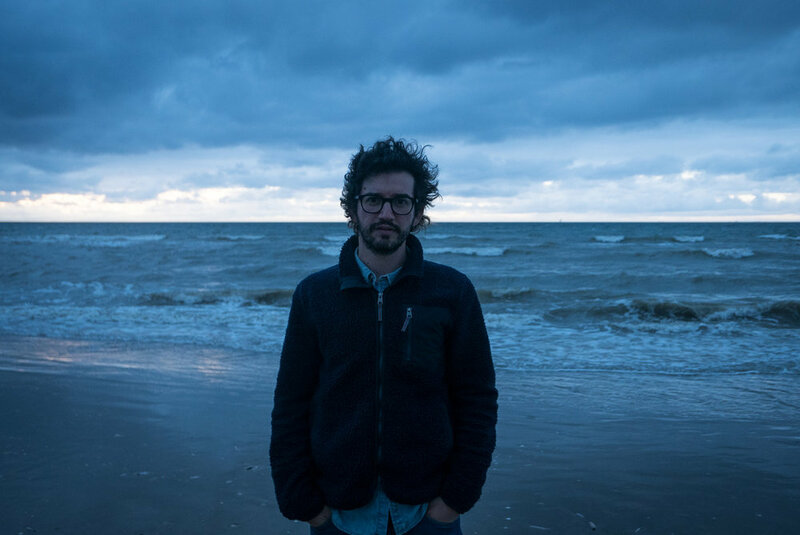 This Chilean artist, who lives and works between Chile and France, often uses image and sound to construct a profusion of intrigues and to occupy the equilibrium between the poetic and the political. His imaginary worlds are attached to one obsessional element—his thinking starts with the sea, a space for memory in perpetual movement, a space for narrative projections where the fate of Chile intersects with grand narratives of voyage, conquest and migratory flows. His liquid images speak of the sparkle of a truth in permanent flight, the backwash of history, always repeating and never the same.